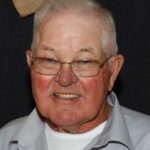 Arlo Trueblood | Gerth Funeral Service, Inc.
Scotland County Rural Fire Dept. He was a proud grandfather. His grandchildren and great grandchildren were his joys in life. He is survived by his wife, Carolyn, of the home; children: Tina Trueblood (Jack Guregian) of St. Louis, Theresa (Tony) Shelley of Arbela and Gene (Penny) Trueblood of Syracuse, NE; a brother, Bob Trueblood of Arbela; a sister, Joyce Spidle of Milan, IL; grandchildren: Danielle (Brandon) Garrett of Kirksville, Andrea (Tim) Graham of Memphis, Teri Trueblood (Lance Smith) of Polk City, IA, Chris (Amanda Calkins) and Dereck Trueblood, both of Lincoln, NE; great grandchildren: Clara, Haylee, Owen, Chesney, Trayton and Kambridge; many nieces, nephews, cousins and friends. Kent and I are so very sorry to hear of the passing of your father. He was such wonderful man. I have so many fond childhood memories growing up in the neighborhood with your Dad & Mom and you and your siblings. Kent will miss his fuel calls visiting with your Dad. Prayers for you all in the days and weeks a head. My deepest and most sincere sympathy to the whole Arlo Trueblood family. I only had an opportunity to meet he and Carolyn once, but feel as though I know them. He accomplished so much in his lifetime and know he will be missed. Arlo will truly be missed at the Granger banquet – he contributed so much to its success. Arlo was always smiling and good to visit with. Our sympathy to Carolyn and his family. So sorry for your loss. He will be greatly missed. Arlo made some beautiful memories with his wonderful bowls. We only knew Arlo for a few short years, he stopped in to welcome us to the neighborhood as soon as we moved in. He was always cheerful and ready to help in any way he could. He will be missed. Our sympathy to Carolyn, Theresa, Tony and the rest of the family. I’m sorry for your loss. Arlo was a great man who always had time to visit with me. He shared is knowledge about cattle, and was happy to share his story’s and experiences with me. So , sorry for Your loss. I know He is without pain and has found many former friends and relatives to visit with in Heaven. He was an impact on Darrell. Darrell only met Him a few times, but made Him feel like He had known Him all His life. Please take care. Know We are thinking of You All during this sad time. Caroline, Tina & Theresa and family-My dearest sympathies. Arlo was such a great man. Be proud of the family he has raised and the memories made. So glad he is pain free and walking on both legs with those who have passed on the heaven. Find comfort in knowing how Arlo’s life was well lived and his craftmanship and friendship lives on in the hearts of so many. Bless you all and thoughts and prayers in the days to come. We are so sorry for your loss. Mr. Arlo was a great man and we are so blessed to have known him. Praying for you during this time. Wish we could be there. Seeing the cows and enjoying time spent in the shop will be fond memories. We are all so sorry about Arlo’s death. He was such a fantastic man, and we’re so happy that he reached out to us several years ago and introduced us to the rest of the Truebloods. We just found out and our prayers are with you. We had been trying to reach Arlo or Joyce, when we found the notice. Sid has such good memories of the family. Please feel free to contact us at any time.